Two squads of infantryman approach an enemy position, one from each side. The commander orders the squad on the enemy's right flank to attack. Rifles and machine guns open fire. The cacophony of the firefight pulls the enemy in that direction as they return fire. Meanwhile, the second squad charges the opposite flank, sound suppressors ­attached to their rifles and machine guns. They begin shooting. The enemy commander has no idea he's taking casualties on that side until it's too late. His position is overrun. His unit is wiped out. It is a potential scenario and capability in the not-too-distant future that seasoned Marine and Army infantry experts are working toward as they gather data, test new technology and experiment with innovative tactics. The Army and Marine Corps are both interested in expanding the use of suppressors, possibly even beyond semi-automatic rifles to include machine guns — even .50-cals. Some have called it the "stealth technology" for infantry. Experts from both services say suppressors offer numerous advantages in a firefight. They suppress muzzle flash and make troops harder to see at night. They can help troops avoid hearing loss and the lifelong effects of hearing damage. But suppressors also come at a cost. They require more maintenance and money, and there are serious questions about their service life. For now, the Marines are more enthusiastic and are testing suppressors more aggressively, while the Army is a bit more skeptical. Weapons suppressors are not silencers like those in movies, where a whisper of sound puffs out of an assassin's gun. Instead, the devices decrease but do not eliminate the bang and sonic crack of high-powered rifle rounds. The first benefit to using them is better communication from training to combat, said Matt Walker, a retired Army command sergeant major who is now the deputy ­director of the lethality branch at the ­Army's Maneuver Center of Excellence. Describing machine gun training on the firing range, Walker said that often the trainer must get beside the gunner to instruct a student, "screaming as loud as he can" to give feedback. A suppressor on the gun takes makes that entirely unnecessary. "It's a miracle," Walker said. Marines on recent rotations in Norway who have been outfitted with suppressors said the same about better communication during live fire events, according to Chief Warrant Officer 5 Christian Wade, the 2nd Marine Division gunner and one of the lead experimenters in weapons suppression. Wade began testing suppressors in Marine rifle squads in October 2016 with fully suppressed M4 carbines and the M27 Infantry Automatic Rifle. 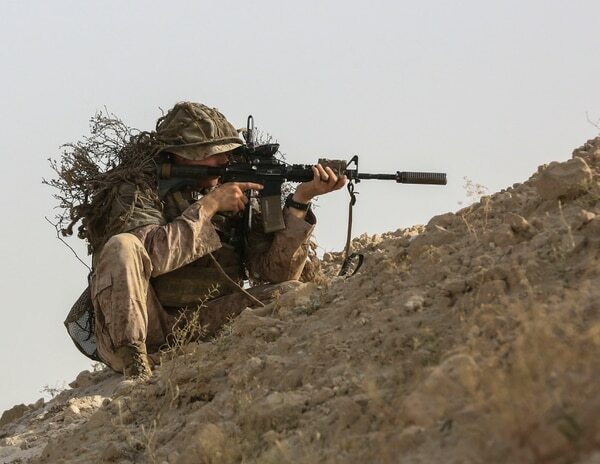 Currently, Marines with Lima Company, 3rd Battalion, 8th Marines; Lima Company, 3rd Battalion, 6th Marines; and Bravo Company, 1st Battalion, 2nd Marines are working with fully suppressed versions of both rifles within their squads. And then there's the Marine Corps' "Übersquad." Wade is outfitting a squad within Bravo Company, 1st Battalion, 6th Marines with suppressors, advanced hearing protection and body armor, next-generation night vision goggles, updated individual communication systems and M320 grenade launchers. Wade's aim is to eventually equip every Marine in the experimental squad with a suppressed M27. Until recently, the suppressors were only used on the 5.56 mm-firing weapons. Last month, Wade entered the second phase of the suppressor experiment — adding suppressors to the M240 machine gun, which fires the 7.62 mm round. Suppressors are not a new technology. The first commercially manufactured suppressor was made in the early 1900s by Hiram Percy Maxim, son of the inventor of the first practical, fully-automatic machine gun. Maxim also invented the car exhaust muffler. The Office of Strategic Services, predecessor to the CIA, used suppressors on pistols for covert operations. Snipers for various militaries used suppressors during World War II. During the Vietnam War, some U.S. troops used suppressors with success in firefights, said retired Army Maj. Gen. Robert Scales, author of "Scales on War: The Future of America's Military at Risk." Snipers and special operations personnel have used suppressors for decades. More recently, the Marines' 2nd Reconnaissance Battalion, 2nd Light Armored Reconnaissance Battalion and some line platoons with combat engineer units have fielded suppressors, Wade, a former scout sniper, said. The suppressor has a relatively simple design, but the Army and Marine Corps hope it will give ground-pounding soldiers and Marines a distinct battlefield advantage. 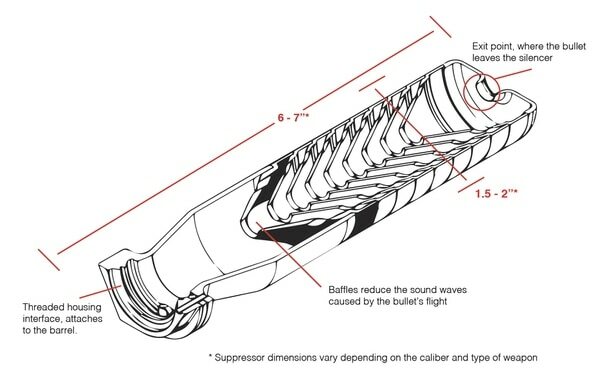 Here's how a suppressor works. Scales said a century's worth of ground combat study shows that the principal target acquisition, whether it's counter-sniper or repelling an ambush, is sound. "There are virtually no instances where an ambushed unit actually sees the enemy," Scales, a Vietnam War veteran, said. "Both sides shoot at flashes and sounds." And most firefights are at night. If a soldier's weapon is quieter than the enemy's, and the enemy can't see the muzzle flash, the soldier has the advantage, Scales said. That is a battlefield advantage when fighting poorly funded and trained insurgents or terrorists, he said. It is a necessity when looking at peer and near-peer adversaries such as Russian troops, who used suppressors when they fought in Ukraine. In the past, suppressors' drawbacks included extra weight and length on a weapon, limited service life of the suppressor, and concerns about reducing accuracy and range, experts said. Yet newer technologies have reduced the weight, and changes to weapon design and barrel length have mitigated some of the concerns, Scales said. Some suppressors, depending on the weapon and caliber it is paired with, weigh less than two pounds and measure six inches with a less than a two-inch diameter. Some concerns persist, especially the increased maintenance and the service life of suppressors. With current suppressors costing about $700 each, getting more rounds and years out of them is crucial at a time of tight military budgets. Walker estimated some suppressors are only good for 1,500 to 2,000 rounds. Walker and Wade both noted that there is increased fouling, or carbon build up, in weapons fired with suppressors due to how the device vents gasses back into the weapon. The blowback also pushes lubricant or gun oil, at the shooter. "They've called the AR-15 [M4 platform] a self-cleaning weapon," Wade said. "It'll clean itself off on your face." The current suppressor being used by Wade's Marines is the Knight's Armament QDSS NT4 suppressor, but Marine Corps Systems Command is reviewing more ­advanced suppressor technology known as "flow-through," and is expected to make a selection soon, Wade said. Wade said some companies that sell the new technology claim that it reduces weapons fouling and increases service life exponentially over current technologies. But Wade cautioned that only further testing will reveal if that claim is accurate. To address concerns among infantry Marines, Wade recently produced a three-minute video posted on YouTube titled "Gunner Fact or Fiction." The video shows Wade firing a suppressed and unsuppressed M4 through a device measuring the speed of the round. Wade said in the video that he had received questions from Marines who were worried that a suppressor would reduce accuracy and speed. The video displays the speed of the rounds in both configurations, and, on average, the suppressed weapon's rounds were faster than the unsuppressed. The gunner stressed that only the use of subsonic ammunition, lower-powered ammo that is quieter when paired with a suppressor, would reduce penetration or lethality. 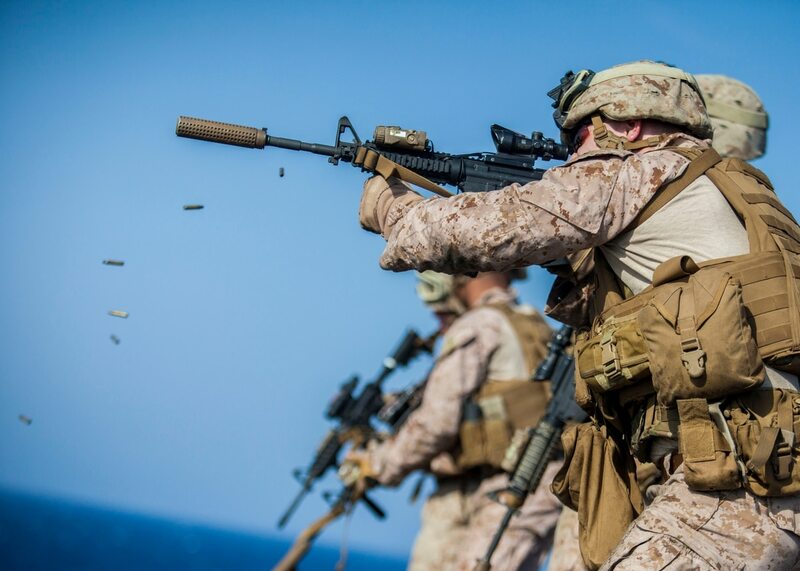 Marines firing the suppressed weapons are using normal, supersonic ammunition and still achieving sound suppression, Wade said. In May, Wade started machine gun suppression testing, using off-the-shelf suppressors among the three test rifle squads. He expects experimentation to run until November and will continue to have the existing suppressors used by new units as they rotate through deployments so he can monitor service life. Equipping an entire battalion would cost approximately $700,000 with ­current suppressor prices, Wade said. But those are not hard and fast numbers, Wade said. "We don't know yet if we want everybody in that battalion to have a suppressor," Wade said. And the testing period that Wade is conducting is just that, a testing period. Decisions about permanently fielding suppressors to Marines will be made at a much higher level. Those will also include when to incorporate the ­technology into a Marine's training timeline. Overall, Wade said he's seeing ­increased accuracy among suppressed shooters. The increases are for two ­reasons, he said. The first is due to physics, and the second is human behavior. The gas flow of a suppressor back into the weapon reduces "barrel whip ­harmonics," or how much the barrel moves when fired. And with reduced recoil and noise, Wade said, Marines are less distracted and able to concentrate more when aiming and firing. "The weapon is easier to shoot," Wade said. Having the capability is a "­no-brainer." The Army has been testing suppressors at the squad level as far back as 2006, Walker said. They've concluded there are some benefits — and drawbacks — to suppressed weapons. The benefits of suppression for individual carbines and semi-automatic rifles has been proven, he said. But the new territory, both in the equipment and tactics, is suppressing machine guns. Crew-served weapons managers and engineers at Picatinny Arsenal in New Jersey this year solicited vendors for machine gun suppressors for 7.62 mm weapons and currently are testing submissions. The Army is looking to possibly equip combat arms soldiers with suppressors, which could change the way soldiers fight. The Army's Research, Development and Engineering Center also has come up with suppressor designs for machine guns in the past year and a half, said Tom Walsh, product manager engineer for crew-served weapons. These items and data being gathered by Wade are feeding into the larger Joint Service Small Arms Program, which will help top leaders determine the future of small arms for each of the military branches, officials said. The engineers with ARDEC and ­Picatinny have worked on suppressors for rifles, carbines and pistols for decades, Walsh said. But machine guns have only entered the mix over the past five years. The Army's interest in the future of weapons suppression is hard to ignore. Recent Army solicitations and projects such as the Modular Handgun System, an off-the-shelf 5.56 mm rifle to replace the Squad Automatic Weapon, and a new .338 Lapua Magnum machine gun all have built in requirements that the weapons be both sound and flash suppressible. But many soldiers believe the ­ear-splitting sound of a machine gun can be helpful in intimidating enemy forces. "On a modern battlefield, sometimes noise is good," Walker said. "When I was a squad leader and you heard the machine gun, you knew it wasn't your fight." If soldiers want the enemy down and not firing, he said, a light or heavy machine gun rattling off hundreds of rounds will grab their attention and allow your troops to move, closing the distance between them and the enemy. Wade said the Marines plan to conduct a third phase of weapons suppression testing that could involve the M2 .­50-caliber machine gun. There are commercially available suppressors for the weapon, which is easily the loudest on the battlefield, but Wade was quick to say there was no commitment to suppress the .50-caliber, nor would a lot of resources be put behind it, at least at this stage. Walker was a tad more blunt about that possibility, throwing a friendly intraservice jab. "I don't see the need to silence the .50," Walker said. "I'm sure the Marines are strapping something on the front of a .50. I'm not sure I'd want to be the one standing behind it when they do."